Cheesy soup gets dressed up with sweet apples, salty bacon, and ooey gooey cheesy croutons! At first glance, this is an unlikely soup. Apples, cheddar, and bacon? “Pass!” you might be thinking. But hold up just a minute… cheddar and bacon is a classic combo, right? And you’ve heard of the whole cheddar cheese with apple pie thing, right? And applewood smoked bacon is totally a thing. So let’s put it all together–apples, cheddar, bacon. Not so unlikely after all! (And pssttt… I made a fabulous Maple Apple Pie Crisp with Cheddar Crust and Bacon Crumb Topping a couple years back!) And if you need further convincing, just think of it this way: this soup has the sweet and salty thing down pat. Cook bacon in a large stockpot set over medium heat until crisp. Remove to paper towel to drain. Meanwhile, remove most of grease from pot, leaving about 2 tablespoons. When bacon is cool, chop into small pieces and set aside. Combine the onion, apples, and potato in the stockpot and saute over medium high heat until onion and apples are soft, about 8-10 minutes. Pour in chicken broth and apple juice, then bring to a boil. Reduce heat to a simmer and cook until potato is soft, about 10 minutes. Remove from heat and season with pepper, then stir in almost all the cheese, reserving 3 tablespoons. When cheese is melted, use an immersion blender to puree soup until smooth. Meanwhile, preheat the broiler. Spread the toasted bread with dijon and evenly divide reserved cheese between slices. Broil–watching carefully!–until cheese is bubbly and melted. Remove from oven, cool for a couple minutes, then slice into bite-sized squares. Serve soup with bacon, cheese croutons, and lots of black pepper. Enjoy! This kale salad is truly awesome. I mean, adding fried eggs and fried potatoes to kale makes it awesome, even if it sounds a little weird at first. You need to try this! Anyway, I love this salad for three reasons: 1) kale; 2) eggs; 3) potatoes. And also for two more: healthy and fried. Total opposites, I know… but kale is healthy… so are eggs and potatoes too. But they’re a little more unhealthy if you fry them… but the kale part takes away the guilt! That, and the potatoes are just pan-fried so that is mucho better than deep frying, right? Soooo, this salad is the BEST combination of healthy and fried, guilt free and delicious. Does that make sense to you? It makes sense in my head so I hope so! You have to experience this salad to understand its greatness. At first Ben was skeptical. I mean, fried eggs on a salad? Bizarre. And, the runny egg part of the fried egg serves as the salad dressing. Another notch on the weird scale, but it works. Plus, the egg gives a little more staying power to the salad. Usually I have to have meat on a salad to make it filling, but not here. Though you could add bacon for some extra deliciousness. 🙂 Anyway you make it, you’re sure to love it! optional additions: diced avocado, crumbled feta, chopped bacon, etc. Wash and dry kale, then cut into thin strips taking care to remove the middle stems. Place in a large bowl and massage with several glugs of olive oil and the lemon juice until kale softens, then season with salt and pepper. If desired, drizzle honey and dijon mustard on top and toss/massage that in as well. Meanwhile, dice potatoes into bite size pieces [1 per person]. Heat a large skillet over medium-high heat and add some olive oil to the pan. When hot, reduce heat to medium and add potatoes. Season with a little salt, a lot of pepper, and some chili powder, garlic powder, and oregano. Saute, stirring frequently, for about 10-12 minutes until potatoes are crispy and cooked through. When potatoes are finished, remove to another dish and cover with foil to retain heat. Reduce heat to medium-low and fry eggs as desired [2 per person]. Serve kale in a big bowl or plate. Top with potatoes and fried eggs, along with other desired additions. Enjoy! This hearty egg breakfast casserole is full of bacon, hashbrown potatoes, red bell peppers [my fave! ], and cheese. It’s sure to please! Weekends call for a delicious breakfast, do they not? While I’m a pancake-girl through and through, sometimes I don’t want to stand at the stove flipping pancakes for 30 minutes. Okay, it’s not always 30 minutes but sometimes it sure feels like it, especially when your family or friends are eating pancake after pancake while all you’ve had are the scraps. Haha, you laugh, but it’s true! 🙂 So what do you do to avoid that situation? Make a casserole, of course! This breakfast casserole was part of my recent foray into eating up the food in my kitchen freezer so that I could move things out of the garage freezer in preparation for my freezer-cooking-before-baby extravaganza. Thank you, leftover half-pound of bacon! Thank YOU, half-bag of shredded hashbrowns! I know the bacon was recent, but those hashbrowns? Who knows! The freezer can be a sc-sc-sc-scaryyyy place. But the good news is, this casserole isn’t anything scary at all! It has all your favorite breakfast components packaged into one tasty treat. Since Ben and I can’t eat an entire pan of this goodness in one go, we parceled it out for breakfast all week long, making mornings a little easier. 🙂 I know this will become part of our regular rotation because it was mighty delicious and has endless substitution possibilities. Enjoy, and happy weekend! Grease a 9×13 inch baking pan with cooking spray. Preheat the oven to 350 degrees F.
Cook bacon on a skillet until crisp, then set aside on paper towels to cool. When cooled, chop into bite size pieces. Drain off most of the grease from the skillet, reserving about 2 tablespoons. Add bell pepper and garlic to the skillet and cook until just beginning to soften, about 4-5 minutes. Remove from heat and allow to cool slightly. Meanwhile, whisk together eggs, milk, pepper, dill, and basil. Add cooled bacon and peppers, stirring gently to combine. Fold in hash browns and cheese. Pour into prepared pan, then bake for about 40-45 minutes or until set in the middle. Enjoy! Casserole reheats well throughout the week, and individual servings freeze well too. Sometimes it’s the simplest recipes that are the best, aren’t they? My family has long tried to find the best cheesy potato recipe because everyone loves them. My sister is pretty much the biggest cheesy potato fan I know, and my husband is pretty much the biggest mashed potato fan I know, so this is a dish to please them both! I’ll admit that some may take issues with this dish because it’s not traditional enough… and there isn’t even any butter in it [gasp!]. But all the cheese and sour cream sure makes up for it. One of the best parts about this creamy ‘n cheesy side dish is that you can make it ahead AND it reheats beautifully in the microwave. Regular mashed potatoes can get kinda weird after the microwave but these absolutely do not! Have I convinced you to make them yet?!? I sure hope so, because they’re pretty much the tastiest version of mashed potatoes I’ve ever enjoyed and I bet you will too! Preheat oven to 350 degrees F. Place potatoes in a large stock pot, cover with water, and bring to a boil. Cook until potatoes are tender, when a fork easily pierces through. Drain and return potatoes to pot. Transfer potatoes to a medium baking dish – a 10 inch round, 8×8 square, or the like, at least 2.5 quarts. Bake for 30 minutes or until hot. Sprinkle with Parmesan and extra freshly ground black pepper, and broil for about 2 minutes until golden brown. Dish can be prepared up until the baking step up to 24 hours in advance. Let dish come to room temperature for at least 30 minutes before baking. If desired, shallots could be sauteed in butter or olive oil for a few minutes to soften before adding to the potatoes. The flavor was fine when raw, but even though they were minced small, we found them a little crunchy, especially the ones that were left on the top of the dish. 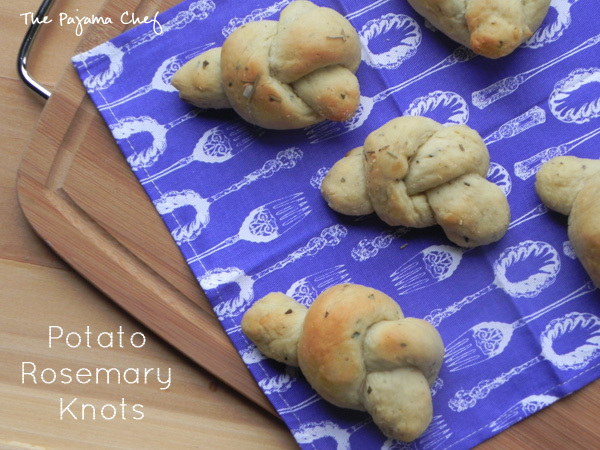 These soft and doughy Potato Rosemary Knots have a fancy shape and are full of lots of fresh herb flavor! They’re a great compliment to any dinner. 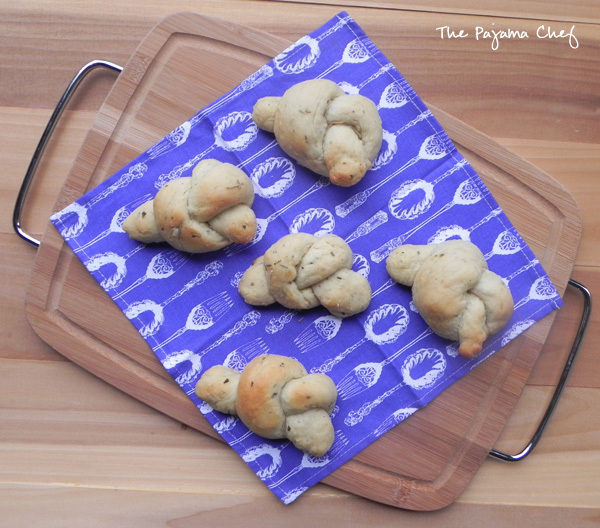 Making fresh bread and rolls is something that I absolutely love to do. I love the process of kneading the dough and seeing it come together from a mess of flour and liquid and salt and yeast into something wonderful. Though I use my stand mixer to knead the dough more often than not, I still like seeing the magic happen. Of course, another perk of the bread making process is the eating process. 🙂 Can’t deny that! Having fresh bread to serve with dinner elevates the meal to the next level. Whenever I walk through the bakery at the grocery store, I’m always tempted to pick up a loaf of bakery bread or a package of rolls. They just look SO good, you know? And it’d be so easy. But then I remember that roll recipes like this one can be made in a matter of minutes as I’m making other components of dinner, and enjoyed for pennies on the dollar instead of dollars on the dollar like at the bakery. Baguettes and croissants are my exception to this rule though, but I’d love to try to make them both! 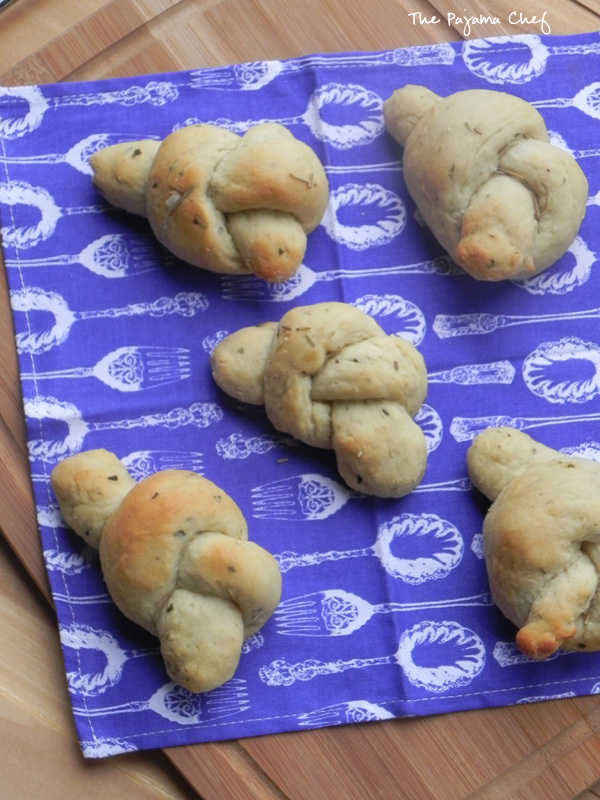 Before making these Potato Rosemary Knots on a recent lazy, home-from-work-early Friday afternoon, I had never baked with potato flakes, flour, or mashed potatoes. I’ve seen so many potato bread recipes, and have enjoyed many a slice before, but never had made it myself. In fact, when I was shopping for these potato flakes I ended up asking one of the Publix employees where the instant potatoes were in the store because I just could not find them! I don’t think I’ve ever bought them before. But I loved seeing how the potato flakes folded easily into the dough, giving it a hearty, nutty appearance and baking into something soft and wonderful. 🙂 For this recipe, I used the requisite dried rosemary but had it been summer, would have used fresh rosemary. I amped up the flavor with a bit of Gourmet Garden’s Italian herbs though! Gourmet Gardens is one of our sponsors for #TripleSBites so it was only appropriate, and it tasted SO good with the rosemary and the extra herbs. Mmm! In a large bowl, combine 1 1/2 cups flour, yeast, sugar, onion powder, salt, rosemary, Italian Herbs, olive oil, and potato flakes. Heat milk and water until approximately 120-130 degrees F. Stir into dry ingredients. Stir in enough flour to make a soft dough, then knead until smooth and elastic, about 4-6 minutes. This can be done in a stand mixer or on a floured surface. Cover with a tea towel and let rise for 10 minutes. Preheat oven to 375 degrees F. Grease a baking sheet with cooking spray or line with parchment or a silpat. Divide into 12 portions. Shape each piece into a long rope [10-12 inches], then tie into a loose knot. Place 2 inches apart on baking sheet, then cover and rise until doubled, about 20-30 minutes. Brush each roll with olive oil, then top with poppy seeds or rosemary. Bake for 15-20 minutes or until golden brown. 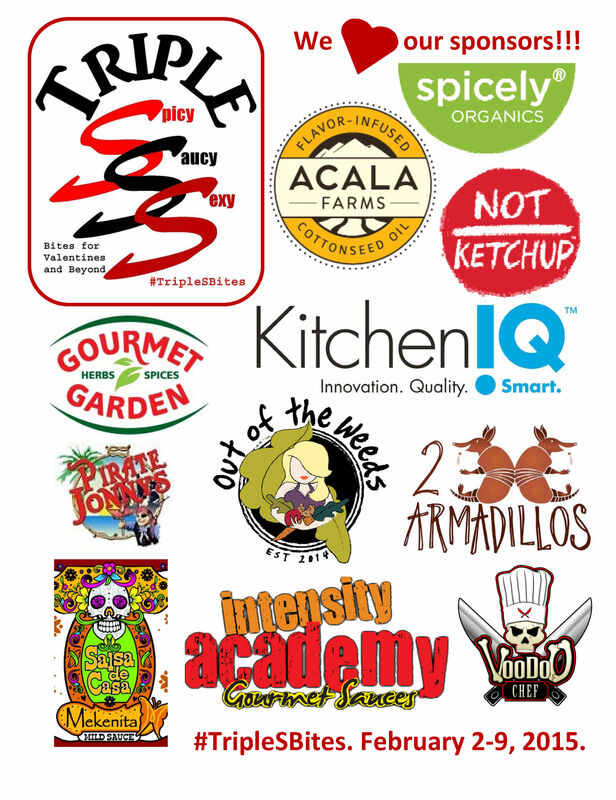 Be sure to check out other yummy recipes from #TripleSBites at the link below! Disclosure: I received herbs and spices from Gourmet Garden as part of my participation in #TripleSBites. I was not compensated in any way–for my time, to create a recipe, or to publish positive comments. I was not required to use these products as part of my recipe. My opinions are my own.